What is Pro Agent Solutions? Pro Agent Solutions is a cloud-based real estate management solution designed for real estate agents and brokers. Described as a comprehensive software solution with an easy to use interface, it has the objective of helping users gain more leads and sell more homes. In addition, Pro Agent Solutions enables them to organize and automate their administrative tasks as well as their marketing campaigns. 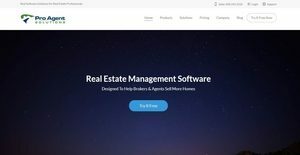 Furthermore, the real estate management software offers a real estate showing feedback system that allows users to automatically receive feedback from their buyers after showing their listing and property. Also, Pro Agent Solutions has a CRM system that organizes their everyday tasks and activities. The real estate CRM system has the capability to notify users when they need to make phone calls to their prospective buyers or they made listing appointments. Last, but not the least, Pro Agent Solutions provides a web-based application that helps users obtain text sign riders for their properties. This application instantly sends them the mobile number of their prospective buyers when they request more information about a listing or property. Setting the right price for listings or properties is imperative in a real estate business. More homes will be sold if they are priced in consideration of market factors. It is also important to have the capability to know what buyers think about a particular property to drive sales opportunities. Pro Agent Solutions provides a real estate showing feedback system that helps users acquire all of these capabilities. This system automatically sends showing feedback questionnaires to agents through email. These questionnaires are used so the agents, who are showing the property, will be able to obtain feedback from buyers. Responses to questions are also emailed automatically to users and their sellers. To use this showing feedback system, users just need to either manually enter their property listings or import them from their local MLS or Multiple Listing Service. The system also automatically imports listings from lockbox systems such as Supra, SentriLock, and Risco Lockboxes. Once the listings are imported, the showing feedback system then instantly sends the questionnaires to the agents and collects responses. Meanwhile, Pro Agent Solutions offers a CRM system that helps users organize and track all the events, activities, and tasks related to their listings. Through the aid of its calendar, users will be able to set schedules for their appointments and important tasks, and receive instant notifications based on those schedules. In addition, the CRM system provides them with marketing automation tools that allow them to use online forms on their website to generate leads. These tools also help them follow up on their leads by enabling them to automatically launch drip email campaigns, send letters, and make phone calls. There is another interesting feature available in the software that allows users to instantly connect with prospective buyers of their properties. This feature is called Digital Flyer. Digital Flyer is a web-based application that enables them to quickly create real estate text sign riders for their properties. All they need to do is to import their property details and images, and assign a property ID. In just a few minutes, they will be able to have a text sign rider they can place in front of the house. When a prospective buyer sends a text message to inquire about a property, Pro Agent Solutions instantly sends information and photos to his or her mobile phone. Interestingly, users also instantly receive notifications through text and email that include the mobile phone number of the prospective home buyer. Because of this, they can easily reach out to their leads. If you are interested in Pro Agent Solutions it might also be a good idea to examine other subcategories of Best Business Process Management Software gathered in our database of B2B software reviews. There are well-liked and widely used systems in each software category. But are they essentially the best fit for your enterprise’s special wants? A market-leading software application may have thousands of subscribers, but does it present what you need? For this reason, do not blindly spend on popular systems. Read at least a few Pro Agent Solutions reviews and mull over the elements that you desire in the software such as the fees, main features, available integrations etc. Then, shortlist a few systems that fit your requirements. Try out the free trials of these apps, read online opinions, get clarifications from the seller, and do your research meticulously. This in-depth homework is certain to assist you select the most excellent software platform for your company’s special requirements. How Much Does Pro Agent Solutions Cost? We realize that when you make a decision to buy Business Process Management Software it’s important not only to see how experts evaluate it in their reviews, but also to find out if the real people and companies that buy it are actually satisfied with the product. That’s why we’ve created our behavior-based Customer Satisfaction Algorithm™ that gathers customer reviews, comments and Pro Agent Solutions reviews across a wide range of social media sites. The data is then presented in an easy to digest form showing how many people had positive and negative experience with Pro Agent Solutions. With that information at hand you should be equipped to make an informed buying decision that you won’t regret. What are Pro Agent Solutions pricing details? What integrations are available for Pro Agent Solutions? Pro Agent Solutions supports integrations with real estate web apps through Zapier. It can also be integrated with lockbox systems such as Supra, SentriLock, and Risco Lockboxes. If you need more information about Pro Agent Solutions or you simply have a question let us know what you need and we’ll forward your request directly to the vendor.